Yafa® is the World's leading source for fine writing instruments including fountain pens, rollerball pens, and ballpoint pens. We have become North America's largest single source for premium pen refills featuring Schmidt pen refills as well as Hauser pen refills. Yafa is one of the World's largest distributors of pen refills and bottled ink. Yafaline® is the promotional division. We feature imprinted pens, promotional pens, ink pens, advertising pens, personalized pens, as well as writing pens, promotional products, and many innovative and desirable promotional items such as the syringe pen. Yafa® (established 1978) is the manufacturer and worldwide distributor for 3 brands, Monteverde®, Yafa®, and Aldo Domani® which are now available in 25 countries. Yafa® Pen Company is also the exclusive, North American distributor for the prestigious Italian brand, Delta® . 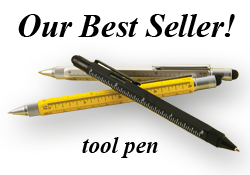 Philosophically, Yafa has been the industry leader in introducing bold, new ideas as well as innovative ways that writing instruments are used and carried. Founder, Yair (Jerry) Greenberg puts it best, “Right from the start, Yafa® products have always stood for quality and value. We will no longer introduce a product just for beauty’s sake. All Yafa®, Aldo Domani®, and Monteverde® pens will now be platforms for innovative new ways of getting peoples’ ideas from pen to paper. This is thinking from the refill - to the outside of the pen - to the paper - and beyond. Yafa is creating new ideas from the inside out, and it is the future”. The all-new 2014 full color catalog has gone to press and will be available soon! This industry leading sales tool weighed in at 44 pages and features many new collections, colors and ground-breaking innovations that are sure to become your best sellers in 2014! Several items have also been retired. The 2014 price list will be sent shortly along with a listing of items that are sold out or in limited supply. The Speed collection has grown! A new piston fountain pen series with a MSRP of $99 has been added; a perfect match for the popular cap-action ballpoints. A bright new orange color with silver trim has also been added in both ballpoint and fountain pen. All new Speed items are in stock now! Many exciting new editions are scheduled to be added in the upcoming months. The 2014 edition of our groundbreaking Indigenous Peoples collection is the Bribri people of Costa Rica. Beautiful! The Journal collection joins the Hippocratica and Lex Lawyers series of pens dedicated to hard working professionals around the world. The latest honors the Journalists who play an integral role in keeping democracy safe all around the globe. Fusion 82: Two new colors, Charcoal Grey and Green resin will be added to the range. Also, beautiful new twist action ballpoint pens will be added for each color. The solid black color will no longer be stocked in the U.S. but will still be available for special order from Delta. Finally, Delta has changed the resin material used in the Blue Scrigno Pen Secret Pens. Images available shortly.! 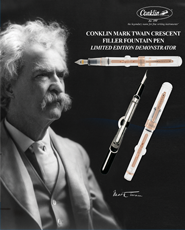 The Mark Twain Demo Crescent limited edition with BLACK trim is now available to all customers. This and the rose gold version are now in stock. The remaining styles of the Limited Edition Deco Crescent collection have sold out. 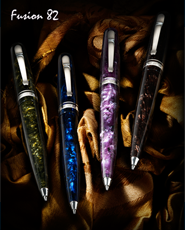 The Glider series fountain pens are sold out and retired. Symetrik fountain pens and rollerballs have also sold out and been retired.